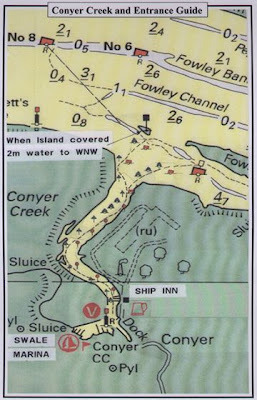 Just along from Faversham and Oare Creeks, home of the Shipwright's Arms, I have discovered another creek, headed up by a small village called Conyer. Intriguingly, my OS map suggested there was a public house present. Some research revealed the pub to be the Ship, and highly recommended it came too, with the Times and Telegraph both including it in articles (Telegraph "Pubs that are well worth a trek" and Times "Britain's Tastiest Walking Breaks"). Indeed the Telegraph says "The Ship lies on the Saxon Shore Way in the boat-building village of Conyer. This is a wonderful winter pub, warm and firelit, with great hot food in the restaurant and bar. There are plenty of books for you to browse over your pint, too." So it was with excitement that Alex, Dad and I cycled there on Sunday, with Hedge in the support vehicle due to his leg being out of action. 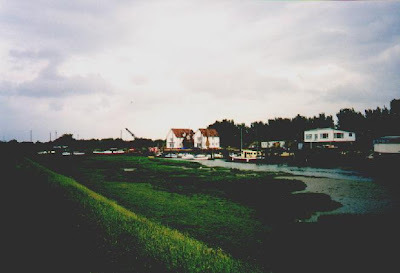 By the time we reached Conyer, about a 12 mile ride from Seasalter, we were more than ready for a pint, and given that the other pub in Conyer, the Brunswick Arms, was closed, we headed along the Quay to the Ship. 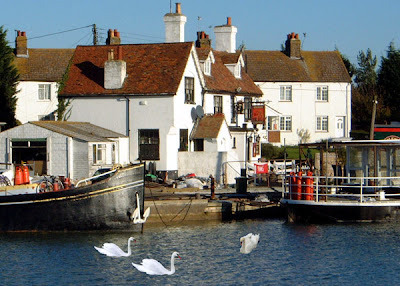 The pub, dating from 1642, is found at the end of the road in a beautiful spot, with whitewashed brick overlooking the pretty creek and marina. Update: I've found the sale details! 37,000 UKP buys one the leasehold! The Ship has now reopened after extensive refurbishment and is fantastic!!!! !